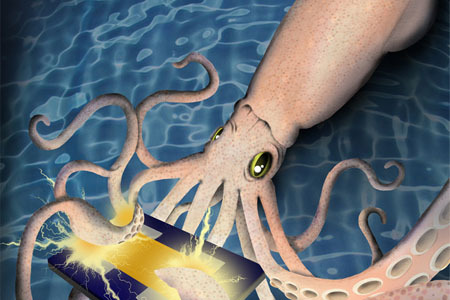 Can Squid Skin Help Power Future Biomedical Devices? A team of researchers at the University of California, Irvine (UCI) has discovered that a protein called reflectin, which is naturally present in squid skin, is a conductor of positive electrical charges — a quality that could be relevant for future medical device applications. Gorodetsky and the rest of the research team produced the squid protein in common bacteria and then used it to make a thin film on top of a silicon substrate. After attaching electrodes to the film, they tested the protein’s electrical properties and concluded that it transported protons almost as effectively as most artificial materials currently available, according to the press release. Researchers involved with the project said that reflectin has a number of advantageous qualities that make it relevant for biologically inspired devices. Because reflectin is a soft biomaterial, it could be used to conform to flexible surfaces and may be less likely than other types of materials to be rejected by the human body. Additionally, the protein could be engineered to decompose when it is no longer needed. Details regarding the project have been published recently in the journal Nature Chemistry. This project is not the first time researchers have explored the possibility that squid could provide solutions for better ways to fuel and build implantable medical devices. Researchers at Carnegie Mellon University, for example, had previously worked with cuttlefish, a close relative of the squid, to develop biologically compatible ways to charge ingestible or implantable medical devices.